When embarking on any big home improvement project, you face a number of design decisions over factors that bear greatly on the final result. Particularly for complex additions—like a new backyard pool—it’s common for homeowners to change their mind over plan details. Worse, some realize too late that their design fails on some fronts to meet their family’s needs and preferences. Your new pool should fully fit your lifestyle and functional priorities. Toward the goal of an ideal backyard resort, it’s vital to carefully weigh fundamental design factors. When meeting with a pool builder, thoroughly evaluate variables that impact the pool structure—and ultimately, how it will look and function for your family. Changes to pool plans can be made before building begins. However, once contractors complete the building plans, obtain required permits and approvals, and begin construction, it’s another story altogether. Typically, plan alterations become costly and trigger building delays. Don’t be a pool buyer who ends up rethinking your choices after building is underway. Let’s take a look at three elements of a pool’s basic configuration about which buyers frequently change their minds. 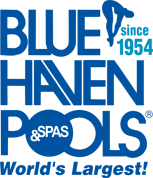 Learn why thorough consideration for each is paramount and how to make the right choice before signing off on any pool plan. 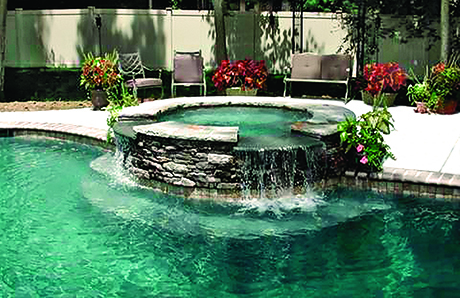 Small and medium pools are perfect for some families and some yards. However, other homeowners can benefit from increased square footage. When it comes to backyard pools, size matters. In cases where buyers rethink the dimensions, almost invariably they wish they had gone larger. In some cases, this size realization comes entirely too late: After the project is complete and family members are using the pool, they come to find it’s a bit cramped; additional space within its configuration would have better accommodated everyone and their activities. To avoid regret about the scale of your pool, strategize ahead of time. Make certain that the pool’s size will satisfy your family’s needs and the ways that everyone envisions using the pool. If you have small children, consider how much room in the water will be available for them for playing. Your little ones need a shallow section at one end of the pool where they can comfortably stand with their heads above water. For a kid-friendly play area, a pool must have the scale to accommodate a large shallow area. That’s because a deep end requires a graduating slope from the shallow end. Creating this incline requires a minimum of length. If the pool is too short, this slope gobbles up a great deal of available real estate—putting a squeeze on what’s left to allocate for a shallow area. If you have a big family or lots of friends you plan on having over for pool parties, you will be glad to have a larger swimming area. Skimp on your pool size, and you might be surprised at how quickly “liquid traffic jams” can develop when multiple people are simultaneously in the water. This aquatic rush hour takes place when one or two people are swimming, one or two others are diving, and a couple of others are playing water games. Similar congestion occurs if you have both a diving board and pool slide. A large pool will provide the needed room to position these accessories far enough apart so that users don’t collide with one another entering the water. Exercise and water sports also demand space and large shallow areas where swimmers can stand. For example, you might want a basketball hoop at the pool edge so kids can take shots from inside the water. Or maybe your plan is for hanging a volleyball net across your water for some friends to enjoy a game. Going too small may limit your pool’s versatility, and it may also hinder your workout. For swimming laps, the sweet spot for pool length is 40 feet. Shorter spans will mean more frequent turns—and more frequent breaks to continuous swimming. The bottom line: Larger pools work well for some homeowners, particularly those with big, active families. To ensure that your pool is flexible for a variety of uses and swimmers, don’t short yourself on its size. Large pools like this one provide room for a generously sized shallow end and deep end. Floor slope between these two areas of a pool must be gradual, and this pool’s ample length ensured room to accommodate safe, incremental depth changes in the structure. Compared to a lot of other pool features, the steps—admittedly—are not exactly thrilling. At first blush, steps may seem dull, but don’t ignore them. Pool buyers don’t realize just how important they can be for the overall functionality of their backyard resort. One reason why: If you want a pool for swimming laps, the design must be correctly configured to support this activity. Steps and their position can make a difference; put them in the wrong place, and steps will obstruct your swim path and disrupt your routine. Step arrangements are also important if small children will be among those using your pool. Youngsters need a shallow place to play. 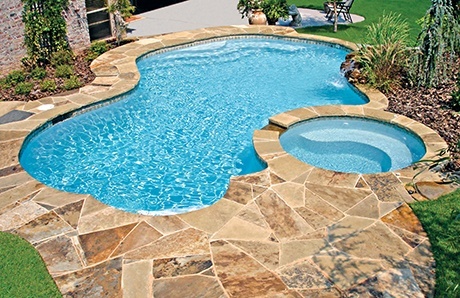 Typically, pools include a traditional three-step entry. However, a smart design solution for young children is to include what’s known as an extended second step. With this kind of design, the second step is longer than the first one by at least several feet. Positioned at 18 inches of depth in the water, this extra space provides a nicely sized ledge upon which kids can comfortably enjoy the water. A related approach is making the first entry step large enough to serve as a tanning ledge (also called a sun shelf, lounge ledge, or Baja bench). Depending on your pool’s shape, design features, and configuration, this tactic may be a feasible option. Having the first step perform dual roles may be more cost effective than incorporating a stand-alone tanning shelf in another area of the pool. Another consideration for thoughtful pool-step design is to accommodate those with mobility issues. Seniors or anyone with physical challenges fare better when the entry steps are wider—providing greater space for a foothold, wider stances for balance, and greater maneuverability. In some cases, four steps—instead of the standard three—allow for a shorter rise between steps. That makes taking on each step easier for those with joint pain, stiffness, or certain other physical limitations. Because entry steps affect pool functionality and accessibility for users, discuss your family’s needs during the planning. Explaining these requests will help your pool designer make informed recommendations about the optimal, size, style, and placement for your entry steps. The entry on this pool includes an extended second step. This functionality provided by this feature makes it an increasingly popular design feature for pool plans. Will you include a spa with your new pool? If so, a decision is needed about its elevation: You can opt for a spa built in the ground—level with your pool—or for a spa built elevated above the pool surface. A raised position—typically 6” to 18”—is a popular choice for several reasons. One is the added functionality an elevated spa brings. Here’s how. A common height for elevated spas is 18 inches from the ground (from the deck area surrounding the pool). That’s the height of a typical chair. This portion of the spa wall that rises out of the ground doubles as a bench, which delivers two practical, functional benefits. First, this exterior wall-bench provides seating outside of the water—on the deck area—vs. patio furniture that’s positioned further away. This perch above the spa water is particularly close and convenient for anyone having a conversation with others who are sitting inside the spa. The wall-bench structure also makes it easier to enter the spa compared with a spa that’s level with the pool. The bench-wall of a raised spa provides a spot to sit, whereas a level spa does not. From a seated position, you can easily rotate and swing your legs over the water and ease yourself in. Being able to swivel your body for this perched position—vs. having to squat up and down standing on the deck—means less effort. Other reasons for higher spa altitudes are purely aesthetic. An elevated design can include a variety of decorative dam walls and spillways. The spillway is where the spa water overflows into the pool surface below. A traditional, single or double spillway becomes a virtual water feature with a lovely cascade effect. Elevated spas can also boast dam walls with a tiered faced, with two, three—or more—stepped ledges. Sometimes called a “weeping wall,” this multilevel façade creates a more gradual path for water to make its way down to the pool surface below. The result is an attractive waterfall effect. Another advantage is the design opportunity afforded by the spa’s raised exterior wall, particularly the front façade. The area provides a span of surface for decorative tile or material placement. You can cover the wall with the identical tile used along the pool’s interior perimeter (the “tile line”). On the other hand, you could also cover the façade in a contrasting manner with a unique tile color or pattern. Another approach is to forgo tile altogether for the spa exterior. Opt for material such as a stone fascia that matches what’s used for the pool’s coping. Or, use a contrasting material for a dramatic look. An elevated spa is a must if you want an infinity spa. With this design, the spillway appears to blend with the horizon—somewhat like an infinity pool. The need for height holds true for a related design—a full-perimeter overflow spa. The entire perimeter of these spas serves as the spillway. If the spa is round or oval, it overflows 360 degrees, and if it is triangular, square, or rectangular, overflows on all three or all four sides. Without a plan that includes a raised spa, these types of designs are simply not possible. Once again, the message here: Consider the design and functionality implications before determining your spa’s elevation. This round, elevated spa features two spillways with flowing water and rustic ledger-cut stone along the exterior façade. Both design features would not be feasible if the spa was built at the same height—or flush—with the pool. In the midst of all your excitement over putting in a swimming pool, don’t gloss over decisions regarding pool size, entry steps, and spa elevation. What you choose today will affect your pool and how you use for years to come. Describe how you think your family will use the pool with your pool builder. Then, the two of you can develop an effective design for your family. One of the best ways to visualize how design options will appear is through a 3-D software presentation. With a virtual reality rendering, you can see a simulation of your new pool and variables like dimensions, entry steps, and the spa. You will even be able to view your new aquatic retreat from various angles and perspectives—including from inside the pool and spa. 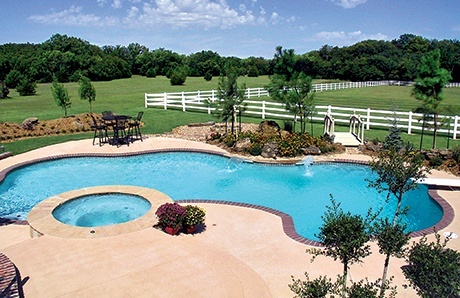 3-D pool plans give buyers an upper hand for evaluating these factors. Plus, because it’s so quick and easy to modify the proposed design, you can test out different options before making final picks. That way, you’ll have a clear mind—having made thoughtful decisions before construction starts.